A Medicine Walk is different from an ordinary walk. It is done alone, in silence, and in solitary connection with the natural world. The intention of the walk is to see, hear, smell, observe, and sense as much as possible. 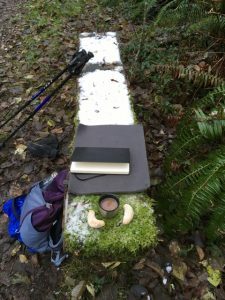 It is a traditional part of the preparation for a wilderness fast and it has become a lifetime spiritual practice for me. In this year when threats to our precious earth loom large I have begun the practice of taking a weekly Medicine Walk. It is a tangible way for me to communicate love and appreciation directly to the wild ones—from trees to birds. These walks on the wild side fill my heart and soul with calm and peace. It is, perhaps, one of my most powerful forms of activism. Beginning in the darkness of winter, I took my first medicine walk shortly after the winter solstice. Each of the five weeks since then I have bundled up and ventured out to immerse myself in Nature for a few hours—sometimes on a local beach, sometimes in the surrounding forest. Carrying a small backpack with my ten essentials, a thermos of tea, a little notebook, and a lifetime of love for the earth, I head out on my excursion. Sometimes important insights come into my thoughts, “Wow, it is hard to quiet my mind. Just observe and appreciate. Don’t plan!” And then I return my meditative focus to observation of all around me. Other times important memories rise up to inform some deeper issue churning inside me. That is where the little notebook and time sitting can be important. Twice already I have surprised myself with an important memory or insight when I pause to write. 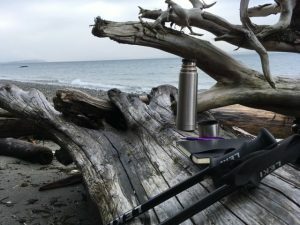 Hiking poles, journal, cup of tea and a sheltered beach spot. Always I return home with what Christina calls “the Medicine Walk aura”. I feel calm. The “to do” lists can wait. My attention span feels increased and I feel hopeful about life in general. From this place I am better able to be a good citizen, community and family member. The winter mosses are incredibly plumped up. Activism takes many forms. It is not just protests on the streets or letter writing or preparing for public hearings—though those things are important. It is also taking the time to engage in our own spiritual practices so that we bring a deeper, wiser, more unshakeable presence to our engagement with the secular world. Rain, cool, wet—woodland mushrooms are at their most gorgeous. Thank you, Ann. You have inspired me to recommit to a weekly walk in my woods. (Perhaps I will call it a peace march.) And thank you also for the reminder that not all activism is extroverted. Ann, I loved reading this reminder of how we can just be, and love the earth as part of our pledge to also take care of it and ourselves. What a beautiful way to stay grounded in all the chaos around us. Thank you especially fo your wet images, a brilliant reminder to me in the middle of a high desert drought, that the source is within us. Oh how lovely–especially the “to do” lists taking a back seat. 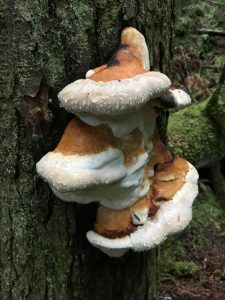 So important….love the mushrooms and you too! This is not only lovely, it is important and valuable to our engagement with the world and our own mind, heart and soul. Thank you, dear Ann, for sharing this spiritual practice. I plan to begin this week connecting in this way. Yes! These walks help to tend to the inner environs…an integral habitat to be cared for, for sure! May I post this on the EarthWays FB page? It’s such a great and clear explanation of this practice?! Of course, thank you for asking. 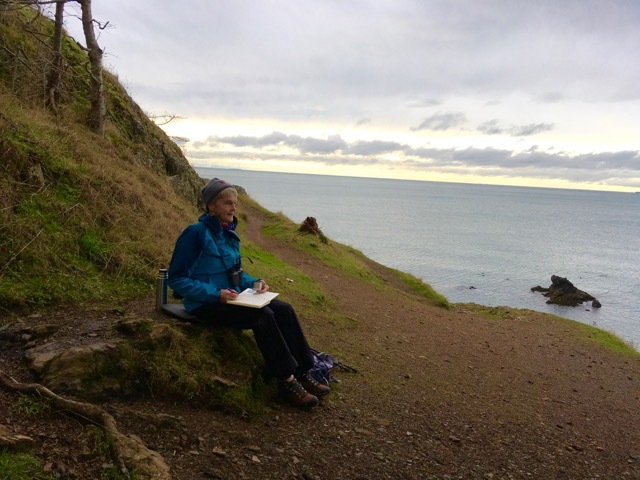 Ann – I just love this application of the Medicine Walk! Thanks for the idea as otherwise I would not have thought of taking my Medicine Walks with this intention. Powerful form of activism indeed! Love, too the mention of “the Medicine Walk aura”!! I know what that looks and feels like! Really appreciating your sharing! Thanks for sharing your wisdom about this sacred practice Ann. I will integrate the journal part. I have been 3x week walks and sitting with the trees here in my new home in the Blue Ridge Mtns of Western North Carolina. I am amazed at how the trees speak their wisdom to me. Thank you, Ann. Sending much love to you and Christina. How very lovely, Ann. Sigh of pleasure. Thank you, Ann – for being who you are, for giving us the reminders of what is truly important. I sure miss Whidbey Island..I may have to return. I have been doing this without a name for it! When I walk with a friend and we chatter, it is fun and healthy, but the most important thing is always missing. So I sneak off on my own, usually at dawn, health and weather permitting. I make sure to touch/caress at least one tree and to get my bare feet on the earth at some point if I can. I usually come home with the seed of a poem and renewed inflow of the Energy of the Universe. Sweet reminder to always come back to the land for sustenance. Thank you so much, Ann, for this blessing of your writings and pictures. I want to incorporate Medicine Walks into my activist week and bring more wisdom to my work from this incredible land and all the healing it brings. Peace by piece. Thank you, dear Ann, for the powerful reminder. While I have taken medicine walks from time to time (either prompted by a deep internal question, or simply to re-align with something greater than my limited self), I haven’t done this as regular practice. Now I’m inspired to follow your example! 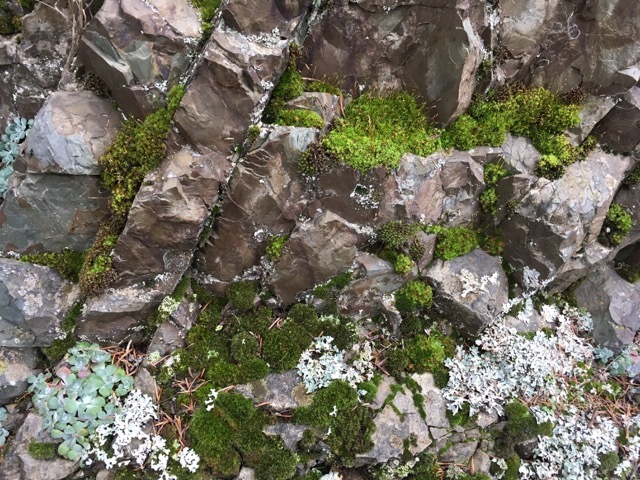 … And my imagination starts going wild: what if we had a global community of sacred walkers, in which we would pair up, go on medicine walks on our (different) lands, and then share & receive stories from the walks (via skype or similar), to deepen insights and connections? Especially for those of us who are not greeted at the door by somebody who smells and enjoys the ‘Medicine Walk Aura’! It would be lovely to spread the practice of Medicine Walks, however that might happen!